To help end veteran homelessness, the U.S. Department of Housing and Urban Development (HUD) and the U.S. Department of Veterans Affairs (VA) are awarding nearly $38 million to help more than 5,200 homeless veterans find a permanent place to call home. The rental assistance announced recently is provided through the HUD-Veterans Affairs Supportive Housing (HUD-VASH) Program , which combines rental assistance from HUD with case management and clinical services provided by VA.
HUD-VASH works in reducing veteran homelessness because it provides funding for both the housing and supportive services that are essential for ending homelessness for tens of thousands of veterans nationwide. HUD-VASH is an important part of the Obama Administration’s efforts to provide critical housing and services to veterans experiencing homelessness. This effort also includes HUD’s Homeless Assistance Programs, as well as VA’s Supportive Services for Veteran Families (SSVF) and Grant and Per Diem (GPD) programs. “Community by community, we’re making significant progress preventing and ending homelessness among veterans,” says Secretary of Veterans Affairs Robert A. McDonald. Since 2008, more than 79,000 vouchers have been awarded and over 111,000 homeless veterans have been served through the HUD-VASH program. 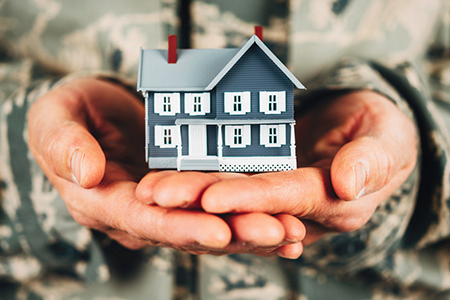 Rental assistance and supportive services provided through HUD-VASH are a critical resource for local communities in ending homelessness among our nation’s Veterans. Additionally, Opening Doors: Federal Strategic Plan to Prevent and End Homelessness serves as a roadmap for how the federal government will work with state and local communities to confront the root causes of homelessness, especially among former servicemen and women. To support communities as they progress towards the goal of ending veteran homelessness, USICH has identified strategies that increase collaboration and coordination among programs serving veterans experiencing homelessness.